Filled with his fragrant presence. Beautiful Picture and well explained, engum vyabithu irukkum shivane, ennatavarkum iraiye potri potri. Thank you fruitu. 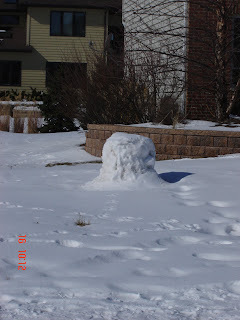 That snow piece was made by someone in front of a house, by I don't know who...but the moment I saw it, it reminded me of a Shiva linga. Welcome Maithri, Nice to see you here! om howm vum joom saha=heals from disease like cancer,swine flue no matter how big disease is. Protects 1 from major disease and earthquakes. I am following up on your advice to chant this mantra. Iwill be in touch again.Thank you.